A paperless office is a great idea but it can be a little harder in reality. If your business can’t banish paper altogether you can cut your paper waste with one of our recycling containers for non-glossy office paper. You throw it in. We recycle it. We deliver the paper recycling containers and we pick them up when it suits you. 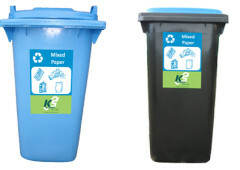 Simply select a container size –120/240 litre wheelie bins or 660/1100 litre bins. We can even offer smaller printer station or under-desk size boxes. If your office paper is a little sensitive that’s ok. We have secure paper recycling containers and weguarantee the security of the materials being shredded so your sensitive papers won’t end up as front-page news! Start paper recycling in your office now and kick back knowing you are helping to create new, environmentally sustainable paper products. We can also offer recycling solutions for cardboard, click here to find out more about cardboard recycling.